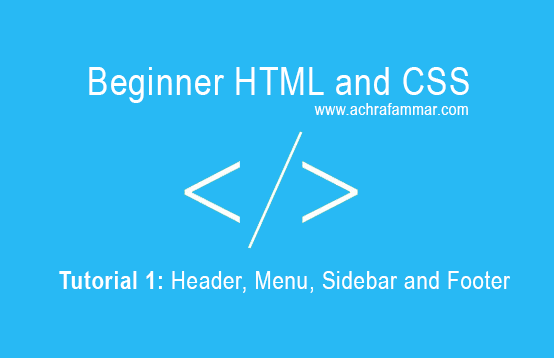 This tutorial is dedicated for CSS beginners. consequat. Duis aute irure dolor in reprehenderit in voluptate velit esse cillum dolore eu fugiat nulla pariatur. quis nostrum exercitationem ullam corporis suscipit laboriosam, nisi ut aliquid ex ea commodi consequatur? Step 1: We will start by designing the body which is the main layout of the web page. We will style the text font and set margins to 0 to eliminate spaces on right side, left side, top and bottom. Step 2: To assign a style to a div with a given id, all we need to do is to create an id selector named #id (The id should always be unique within a page). In our case, the id is called header so we are using #header in CSS. Below we are defining the header’s background color, text color, text alignment and setting margins. Step 3: At this stage we want to style the main menu in a horizontal way. So the div element containing the main menu has an id called nav_main and as I mentioned before we will use an id selector called #nav_main. Now the tricky thing here is the fact of using a list as a menu, we all know that lists are represented vertically so how can we make them horizontal. The key point here is the float property. Click here to learn more about float. This property will be applied to li elements to make them all float on the right of page inside their container which is the nav_main div. The padding property is applied as well to make space between elements as by default float will put all elements on each other. Step 4: As we have two different menus in our page, it would be better to put them in different places. The sub-menu can be represented as a sidebar using the magic magical property float. Step 5: For the content is up to you how you want to design it, the following code is so basic but the remarkable property here is padding-bottom which is used to avoid an overflow problem between the content and the footer. Step 6: The final step is making the footer stick to the bottom of the window no matter the height is. To make it happen, we will use a new magical property called position which allows us to give fixed position to elements basing on given distances from the window’s 4 sides. For example, if you want to place an element right in the middle of the screen you say that the distance is always 49% from each side (distance is always based on the element’s dimensions). Now this is how the final mystyle.css file will look like.